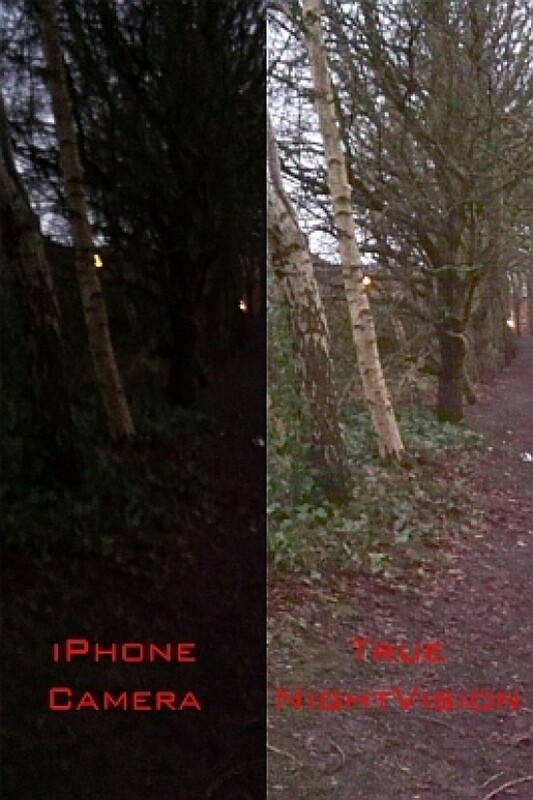 True NightVision 1.5 is an iPhone app that brings advanced real-time low light-video enhancement to the Apple iPhone 4 and 3GS. When it’s way too dark for the iPhone camera, True NightVision can enhance the image using advanced light amplification technology so you can see what is out there. It works best in low light, such as a night with a full moon, but it will not work in very dark conditions. TrueNightVision is available now priced at $0.99. Advanced realtime low light video enhancement is now available on the iPhone, without additional hardware. True NightVision 1.5 uses cutting edge video technology to deliver incredible low-light vision on iPhone 4 and 3GS, not just for photos but live video, in smooth, sharp HD on iPhone 4. It is a serious night vision app with powerful digital zoom and a selection of color filters for enhanced night time viewing. Warrington, United Kingdom - Advanced realtime low light video enhancement is now available on the iPhone, without additional hardware. True NightVision 1.5 uses cutting edge video technology to deliver incredible low-light vision on iPhone 4 and 3GS, not just for photos but live video (in smooth, sharp HD on iPhone 4). Cameras struggle with low light scenes, but advanced processing techniques can literally turn a black picture into daylight. Now British software developers Interealtime bring this technology to the iPhone with True NightVision, using cutting edge video enhancement to deliver incredible low-light vision not just for photos but live HD video. When it’s way too dark for the iPhone camera, True NightVision can enhance the image using advanced light amplification technology so you can see what is out there. It works best in low light, such as a night with a full moon (it will not work in very dark conditions - this is beyond the limits of current iPhone camera technology). True NightVision is a serious night vision app with powerful digital zoom and a selection of color filters for enhanced night time viewing. But it’s also fun, with live effects such as thermal imaging that look great during day or night and work together with enhancement. Take HD photos (iPhone 4 - lower resolution on 3GS) with enhancement and effects. And all with full, smooth, live video. True NightVision 1.5 is only $0.99 USD (or equivalent amount in other currencies) and available worldwide exclusively through the App Store in the Photography category.